independent sections of the board – if needed the board can be physically cut in the middle in order to separate the sections and reduce the physical dimensions. The laser driver section provides a current of up to 5A through an integrated DC-DC converter. The maximum value of the current and thus the maximum intensity of the laser diode is set by two on-board trimmers. The actual current through the laser diode at each point in time is controlled via a modulation input supporting analog and TTL modulation of up to 5V. The maximum modulation frequency is about 500Khz. If there is no modulation source, the board can also work in constant current mode. The working voltage of the laser diode is set via an on-board trimmer and ranges from 1.8V up to 25V depending on the power supply. There is also an opto-isolated input for enabling the laser diodes or shutting them down in emergency situations (e.g. overheating). RV6 trimmer – at the moment used to set the target temperature of the laser diode. RV7 trimmer – at the moment used to set the maximum voltage/current of the TEC element. I2C pin headers – at the moment used to control a 20×4 Hitachi-typeOLED display. A heatsink can be attached to the backside of the board if needed. 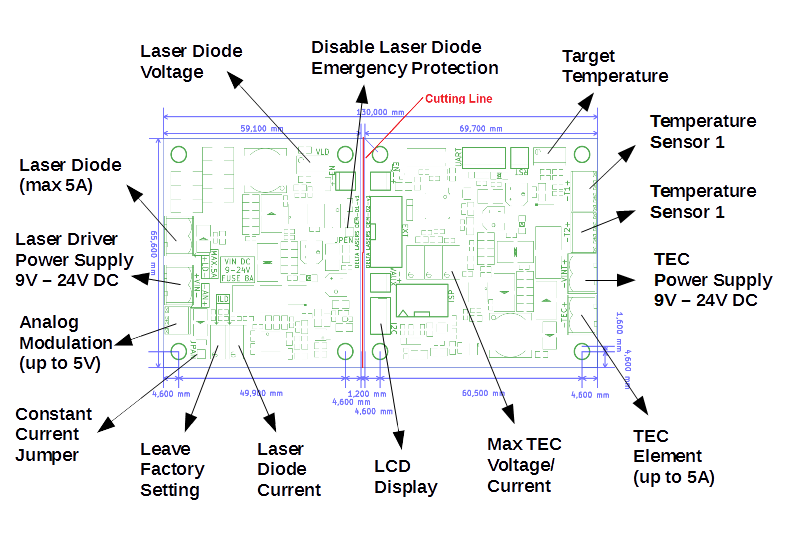 Especially important for decreasing the overall board temperature is a suitable setting of the laser diode operating voltage by means of the trimmer VLD. The voltage VLD should be between one and two volts above the laser diode forward voltage.